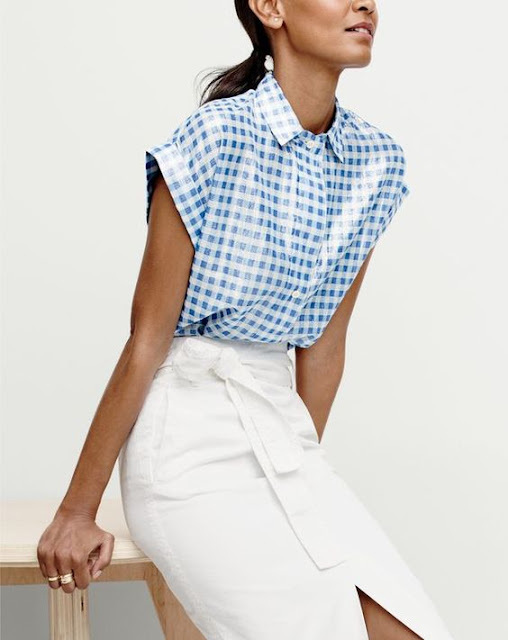 Hoorah for gingham! It's so fresh, so crisp, so perfectly ordered, it's definitely one of my favourite fabric patterns. I've always loved it, so when Karen announced she was running a Ginghamalong at Did You Make That? I was onto it like a shot. The big question is, what kind of gingham masterpiece shall I attempt to make? 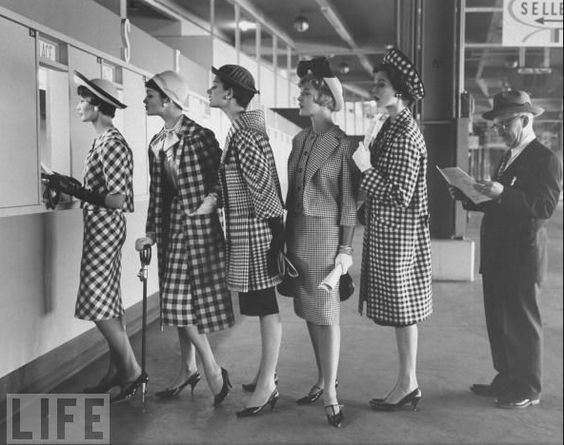 I have a gingham board on Pinterest which is chock-a-block with inspiration. I've also sewn a lot with it over the years, making tops and blouses (here, here and here), dresses (here, here and here) and skirts (here and here). 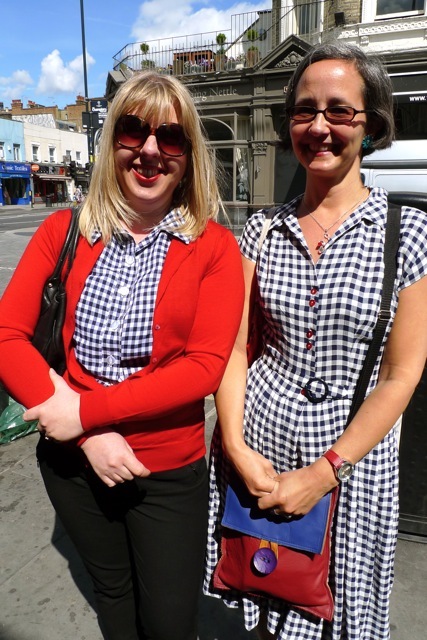 But the gingham item I've worn most by a million miles is my 1950's sleeveless blouse, now sadly deceased. 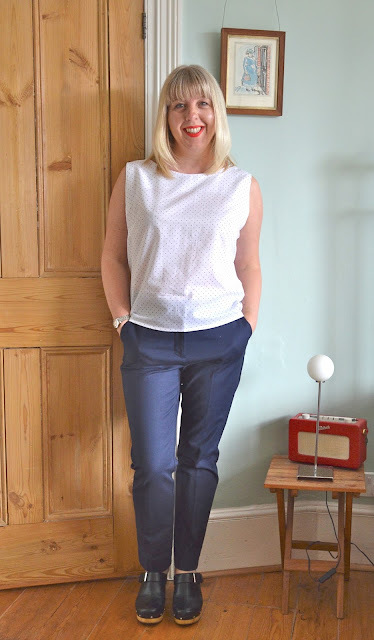 I loved that top and it had a good life - I literally wore it until it fell to bits! 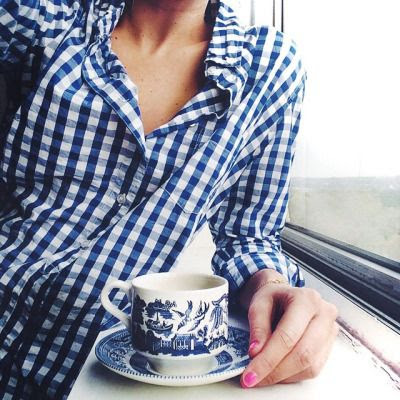 There's just something about navy gingham that seems to work for me. I've been making a concerted effort recently to only sew things I know I'll actually wear, so a classic navy gingham shirt seems to be the way forward. It's not the most exciting choice in the world but it's certainly chic. I love the fit on the Sewaholic Granville Shirt, so that's the pattern I'll be using. I'll probably keep the sleeves short or even go sleeveless as I find long sleeved shirts are a massive pain under fitted cardigans. I've ordered my fabric (½' yarn dyed cotton) and can't wait to get started! My Vintage Pledge Shoulder Tie Top has been such a success I thought I'd whip up another one in a summery fabric for my holiday. The pattern is a Woman's Own mail order pattern from 1961 and this latest version is made from some lightweight polka dot lawn I received from Cindy a few years ago. I've used quite a lot of it for various linings, but with some imaginative cutting out there was just enough left for this top (I cut the front pattern piece on the fold, which eliminates the front split). The neck and armholes are finished with all-in-one facings, which I had terrible trouble getting to grips with when I used them on my Betty dress. I've since discovered a step-by-step guide to sewing them on the Sew Over It blog which finally made something click in my brain - I'd definitely recommend it for this technique. Everything is finished by machine which gives the facings a clean, professional feel. 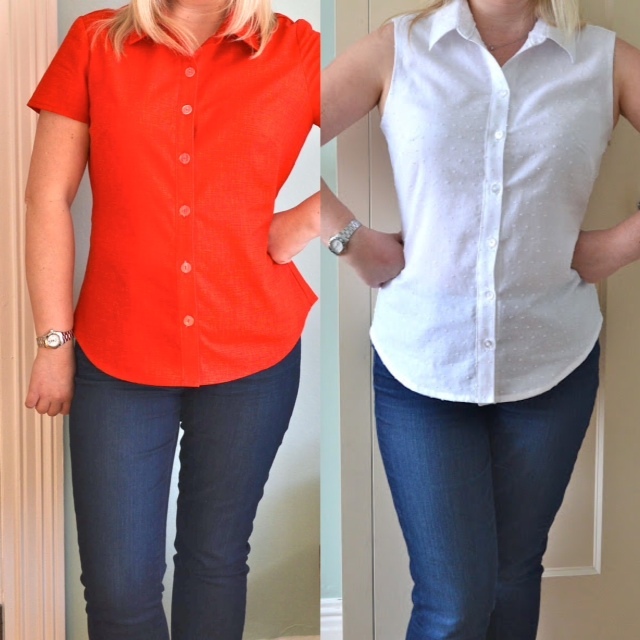 The thing I like about this top is that the shoulder ties are removable so it can be worn two ways. It performs valiantly as a plain, no nonsense tank top…. But add the shoulder ties and there's suddenly a suggestion of gathers to the shoulders and a touch of vintage interest, yay! The ties can be added to any sleeveless tank or singlet - I simply knot mine once around the shoulder seams and they seem to stay in place all day. If you prefer a smaller tie or have particularly slippery fabric then tying a double knot will make them even more secure. It's also your choice whether or not you interface your ties. I didn't use interfacing on either of the two versions I've made and I like the resulting drapey effect. Adding interfacing will probably result in a more structured tie. Please note that the measurements for the ties are taken directly from my vintage pattern piece and are in inches as that's how they were drafted. The seam allowance for this project is ½". Half a yard/metre of fabric with selvedges folded into the centre so you have two folded edges. 1. Mark a rectangle on your paper 16.5" long x 2 ⅝" wide and cut out. 3. Join the measurements together and cut along the lines to make a point. 4. Repeat at the other end (you can simply fold your paper in half widthways and draw round the point). 5. Mark a fold line along the top edge. You should now have a pattern piece that looks like this, with the lower diagonal lines slightly longer than the upper ones. 6. Place your pattern on the fold(s) of your fabric and cut two separate pieces. This is what each piece should look like opened out. 7. Fold the fabric lengthwise with right sides together and place two pins about 2 - 3 inches apart in the middle of the unfolded edge. The pins will mark your turning gap. Pin the rest of the edges together if you need to. 8. Starting at one corner along the folded edge, sew right round the edge using a ½" seam allowance. Stop when you get to the pin marker. Repeat on the other side. I sewed this sample with black thread so you can see the line of stitches. 9. Trim the seam allowances and snip off the corners on the pointed edge to reduce bulk, then turn your tie the right way round. 10. Poke into your corners with a point turner or similar to ensure you have a nice pointed end. Give the tie a good press, making sure the seam allowance of the turning gap is pressed under too. 11. Machine stitch across the turning gap close to the edge (or catch stitch by hand if you prefer). Repeat for the other tie. Ta-da - two lovely shoulder ties! This was mostly down to a silly error I made regarding the instructions (sigh). The area I struggled with most was the zip fly, a few of the steps seemed to be incorrect and some of the diagrams were downright confusing. After eventually working out how it all went together, I decided to email Grainline to point out the errors I'd encountered. It was only when I was looking up Grainline's email address that I discovered an old email from them which included (you guessed it) updated PDF instructions for the fly steps. Nooooooo! When I looked at the new instructions (with gritted teeth I might add), every single point that I'd struggled with was explained more clearly and/or a different diagram used. Grrr I'm so annoyed at myself for not updating my PDF file when I first received it. I still don't think the new fly instructions are absolutely foolproof, but they're a vast improvement on the earlier version. 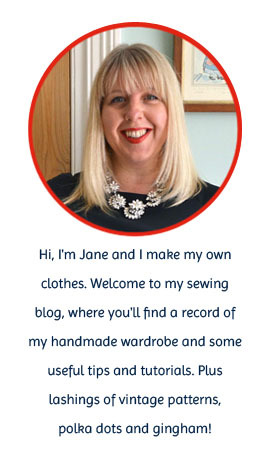 If you have no prior experience of sewing a zip fly then I'd recommend using the step-by-step tutorial on the Grainline blog alongside the written instructions. It definitely helped me figure out what to do when I was floundering! Apart from the zip fly, construction of the shorts is relatively straight forward. Just take note that the very first step on the curved side pockets involves sewing convex and concave curves together - once you've figured that bit out, you're laughing. I like how the rear patch pockets have a nice, clean finish to them once they're topstitched into position. By the way, the top folded edge is actually supposed to be on the inside of the pocket but I prefer it this way round. For the front pocket lining I used a soft blue cotton, which gives a cute little burst of floral to the insides. The fit is amazingly good. I was tempted to size up 'just in case', but I knew my fabric had a lot of stretch, so I cut the size that corresponded to my actual measurements - size 6. I fully expected to have to tweak the centre back waistband as I'd read a few reviews mentioning excess room in that area, but they don't gape at all. I love the fit - they sit snugly just below my natural waistline and are really comfortable. There isn't any digging in at the waist and the width of the thigh is just right. This makes me happy as I've tried on lots of shorter length RTW shorts recently and not one pair did me any favours. To get a comfortable fit at the waist, they're always either too big round the hips or wide in the leg (think Don Estelle). The fabric is a medium weight stretch cotton sateen from Fabric Godmother with a slight sheen to it. It's perfect for shorts as it's easy to cut out and sew and very robust. If you like the look of this particular pattern and fabric combo then Fabric Godmother also sells a Maritime Shorts Kit which includes the pattern, fabric and notions and works out slightly cheaper than buying everything separately. Fabric for the shorts was given to me free of charge by Fabric Godmother for review. All views my own. 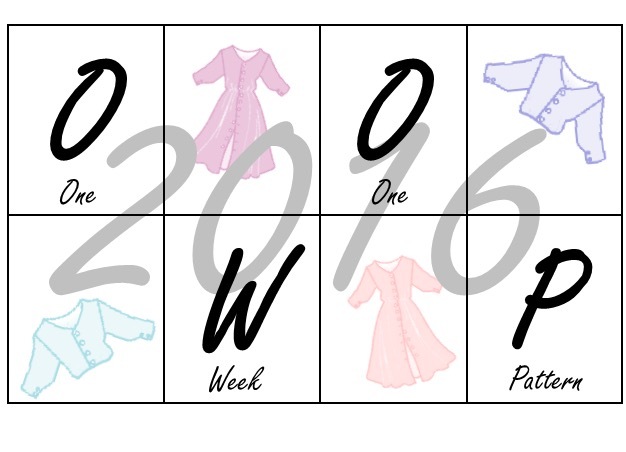 Hands up who remembers OWOP (One Week, One Pattern)? Of course you do, it's the group sewing challenge where participants wear variations of the same pattern, every day for a week! 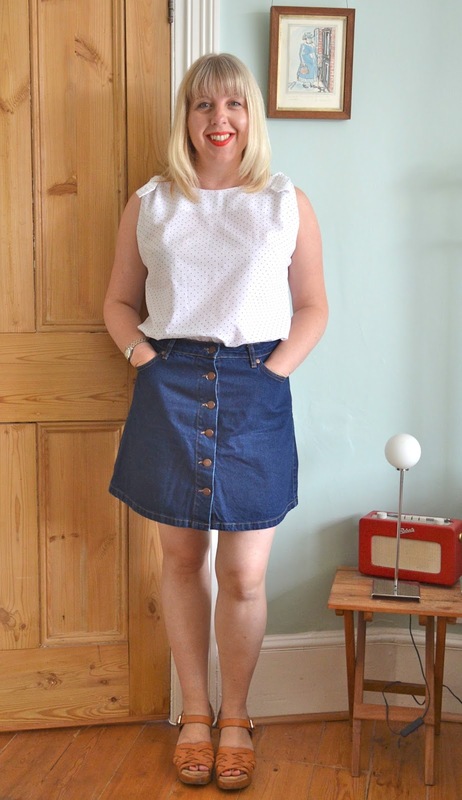 The original challenge was created by Tilly in 2012, I resurrected it in 2014 and now Hannah from Cinderellis Sews is hosting a new challenge for 2016. Hoorah! My favourite part of both challenges was working out all the different mix and match combinations with my chosen pattern. In 2012 I chose the Colette Ginger skirt, a high waisted A-line skirt that proved to be endlessly versatile. 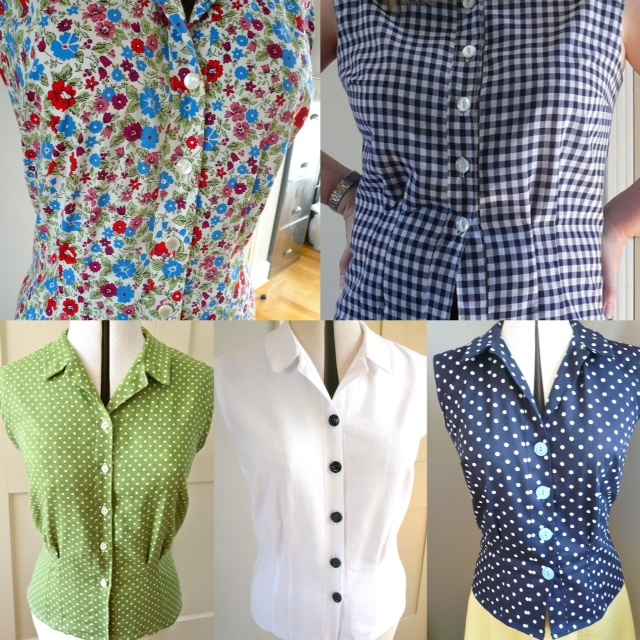 For the last challenge I went for a vintage pattern - Simplicity 4238 - a 1950's button up blouse that's become a real wardrobe staple. The big question is, what to choose this time round? You may have noticed I've been more than a little obsessed with New Look 6217 of late (I have three versions of the top and two versions of the skirt), so that's currently the strongest contender. However, I also absolutely LOVE my Sewaholic Granville shirts and although I only have two versions (here and here) they're both solid colours, so they match absolutely everything. The Granville shirt would certainly be a greater challenge, but may be a bit too similar to the last pattern, what do you think?